The next evolution of the CCM skate line has arrive. The CCM JetSpeed skates are on the Great Skate shelves today. The new skate places a focus on increased footspeed thanks to a brand new fit profile. While the JetSpeed features a similar graphics package and look to the RBZ skates line but that’s just about where the similarities end. The RBZ featured a very comfortable, wide boot design which actually ran a good size bigger than most other skates on the market. While the RBZ offered a number of impressive features, the overall fit wasn’t conducive to increased footspeed. The entire fit profile is different in the JetSpeed skate. The narrow boot features an improved heel lock and low volume design to ensure a contoured fit. CCM’s Rocketframe composite heel construction wraps fully around the heel and promotes a snug fit in the heel and up through the ankle. Along with Rocketframe, the Speedcore 2 heat moldable boot creates a truly unique fit for each and every player once the skates come out of the over. The contoured boot is promoted through the Speedcore 2 construction. The narrow toe and forefoot area continues the contoured, anatomic fit profile of the skate. All of this ensures that the JetSpeed skates are the most responsive skates on the market. With a more responsive skate, you can count on a quicker power transfer and more explosive starts and stops. CCM also developed a new tongue for the JetSpeed skates. The JetProtect tongue is a multi-layered feature that features a thick, pro-style felt backing with a hard shell on the outermost layer to provide additional protection. The Speedblade 4.0 holder and Hyperglide runner return as mainstays of the entire CCM skate line. Nothing is more drastic in difference or performance than the new contoured fit, however. The stiff carbon boot construction is built to react to each and every stride taken on the ice, giving players next level speed and responsiveness. CCM is the legendary hockey brand fueled by endless pursuit of performance. For over a century, CCM has been there for players from the first time they step on ice to the pinnacle of their careers. Today, CCM continues to draw inspiration from its rich history by offering the innovation and performance that will help write the next chapter in the history of the game. The brand new Ultra Tacks is the lightest, best balanced, and most durable stick we have ever created. The new Ultra Attack Frame blade is incredibly light without sacrificing torsional or bending stiffness, so you have a lightweight product with amazing precision and accuracy. The innovative Bumper Technology reinforces the corners of the shaft for outstanding durability and consistency. The ULTRA ATTACK FRAME is the lightest blade we have ever made but still provides very high levels of both torsional and bending stiffness. The result is an incredibly light and well balanced product with more accuracy, better precision, and amazing consistency. Designed for state-of-the-art protection, the CCM Ultra TACKS family redefines the standards by adding the innovative D3O® foam technology to its line. Engineered to react to fluctuating intensities, the round-breaking smart foam will keep its soft consistency to absorb low impacts while instant hardening at higher intensity impacts to protect against big hits. CCM Ultra Tack Shoulder Pads offers Dual Core HD Foam shoulder caps with D3O smart foam and adaptable shoulder systems. While the Shin Pads offers PE Cap with D3O smart foam on the knee joint and new Neo wrap lock strapping system. With an already popular design by Jofa/Reebok CCM redefines the art of protective equipment in the elbow pads with the joint discharge PE cap with D3O smart foam and new Lycra strap & lock strap. What is D3O? D3O is an extremely clever, globally unique technology that is based on the innovation of capturing the benefits of non-Newtonian shear thickening material in polymers that can then be engineered for real world impact protection solutions. These enhanced properties offer a number of different performance benefits depending on the base polymer used and the intended application. How D3O works? D3O materials in their raw state flow freely when moved slowly, but on shock, lock together to absorb and disperse energy, before instantly returning to their flexible state. This reaction is counter intuitive. The greater the force of the impact, the more the molecules lock together and the greater the protection. There’s something very important that has been overlooked recently in virtually every facet of sporting culture; helmets alone don’t prevent concussions. That can be a bit unnerving to read and think about because if the helmet you’re wearing can’t prevent you or your child from getting a concussion, how can you be at ease? Don’t worry, the helmets on the market today are the most technologically advanced helmets ever made and offer protection from a wider variety of injuries than ever before. The point that needs to be considered is that the helmet alone won’t prevent from concussive impacts. Plenty of research has been done in this field and a great deal of it paints the picture that all the bells and whistles in the world won’t limit the impact and results of high speed collisions. Helmet’s like the Bauer RE-AKT and CCM Resistance have added groundbreaking features that help keep the head protected from both direct and rotational impacts experienced during a hockey game. This was a big step forward in both design and safety as limiting the effect of an impact against a player’s head. So what does this all mean? Does it mean that you’re no safer with a mop bucket on your head versus a state of the art helmet like the IMS 11.0? Of course not. But simply picking the most expensive helmet you can find and expecting your problems to be solved is far from the solution as well. When it comes to buying a new helmet, comfort and fit are just as important as the protective qualities of the helmet. I have a handful of helmets in my locker and they all offer a different fit. There is one that I don’t ever wear because it doesn’t provide a snug, safe fit that will keep me protected. The helmet in question is a CCM V08. It’s a phenomenal helmet that is wildly popular at the NHL level that simply doesn’t fit my head. It looks great and I was incredibly excited when I got it. And then I found out it wasn’t going to fit and I’ve never worn it on the ice. Meanwhile, my Bauer IMS 9.0 is the most comfortable helmet I’ve ever owned. It sits a little higher on my head than other helmets, but the combination of HD foam, Poron XD foam and other protective elements provides a great fit that I know provides adequate protection. Obviously none of that means that if I was to hit my head on the ice the wrong way I wouldn’t be concussed, because the most likely result of that would indeed be a concussion. The key is that I made sure to try on a number of different sizes of helmets with a Great Skate sales representative before making a decision. I tried on different makes and models of helmets before settling on the one that had the best overall fit and, therefore, offered the most overall protection. After making my purchase I’ve made sure that all the hardware is up to par and that the helmet is stored properly. This ensures it dries properly after games and the padding will stay intact. BY making sure the hardware is taken care of means that I won’t lose a screw halfway through a game. Proper maintenance and care for your helmet is just as important as finding the right helmet with the right fit. If padding is falling out of your helmet due to poor care, it’s time to reconsider how you store and take care of your equipment. Furthermore, if padding is falling out of your helmet, it’s probably time to get a new one. It can be worrisome to hear that as different and protective a helmets can be, that they all can’t prevent against concussions. New helmets are able to lessen many impacts – and in turn help to reduce concussive impacts – but many times concussions aren’t avoidable. It’s important to do all the necessary research when you’re planning to buy a new helmet. Know your pricepoint, know the style you want and then make sure to find the model that fits you best. Take some time to fully evaluate the helmet you wear. Maybe you’ll find that the fit isn’t idea or that some of the interior padding has deteriorated. If that’s the case, take the time to research a replacement before heading to Great Skate for a new lid. Hockey apparel wasn’t always as prevalent or as readily available for purchase as it is today as there was a time not too long ago that branded apparel was very hard to come by. Now every manufacturer has a bevvy of hats, t-shirts and sweatshirts adorned with their logo and products. The same goes for hockey lifestyle brands like Gongshow which cater exclusively to hockey players. In the event that you haven’t found the right gift for the hockey player you’re shopping for, take a look at the hockey apparel at Great Skate. Great Skate’s hockey apparel includes products from CCM, Bauer, Easton, Gongshow, Reebok, Warrior and many others. Whether sporting it at the rink or just when they’re hanging out, products like Bauer hoodies and CCM hats are always a go-to for hockey players of all ages. What’s even better is that these great gifts can be found without worrying about breaking the bank. The Bauer New Era 3930 hat might be the hottest item of the year as it’s nearly impossible to walk into a rink without seeing one or two of the great looking hats. CCM’s national pride inspired hats are also popular with every age group and they have a very cool set of knit winter caps out for this holiday season. Another great hat for the cold winter months is the Great Skate Bauer winter hat. It’s warm, attractive and sports the very cool Great Skate logo on the front. A pair of personal favorites happen to be the Bauer softshell jacket and the Easton Synergy midweight jacket in case you need a little more protection from the elements. These products represent a small portion of the terrific hockey apparel at Great Skate that could check off the gift needs of any hockey player on your shopping list no matter how young or old they happen to be. Whether shopping online or at our store you’ll be sure to find what you’re looking for. 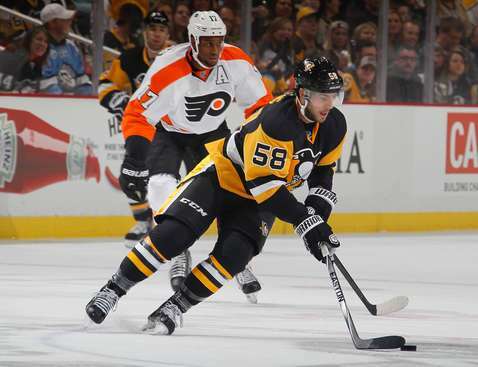 The Pittsburgh Penguins took to the ice in their new third jerseys on Wednesday night, marking yet another alternate uniform to grace the NHL’s growing collection of jerseys. While those fans who collect jerseys and add all the newest duds to their collection each year are abundant, I’ve noticed something even cooler than the jerseys themselves in recent years. As teams get more creative with their marketing strategies, implementing more unique designs and traits to third jerseys is a growing trend. Unique socks – which are always cool to add to your practice or pick-up arsenal – special pants or pant covers and even different decals for the helmets are all common for teams who add alternate jerseys. The Penguins and Islanders have taken that to the next level by adding new gloves to their alternate uniforms that work perfectly within the design of the overall uniform. The Islanders decision to add white fingers to their gloves is interesting and unique. It took some adjusting, but now seeing the entire uniform in use makes me think there is more than enough room for more contemporary designs when it comes to alternate jerseys (Buffalo excluded). Pittsburgh’s gloves, however are a real treat. As their new uniform hearkens back to their Cup wins in the early 90s as do the gloves. Leaving no detail unnoticed, the Penguins are donning black based gloves with basic white trim just as their team gloves looked back in the 90s. This is an awesome addition. Many “throwback” uniforms feature the team’s normal or slightly altered gloves that use the same colorway. Not this time. The Penguins went full-on 1991 with their look and it really helps bring everything together. Luckily virtually every company features a basic black and white colorway with their gloves. Which means that you can replicate the Pens’ look with relative ease. The Bauer Nexus, Warrior Dynasty and CCM 4Roll Prime both offer a vintage look and feel, especially if you’re going the black and white route. If you’re thinking of switching your look around for the upcoming year, consider grabbing a pair of alternate Reebok Edge Socks and a pair of gloves that give a vintage feel to bring it all together. Connor McDavid has always been worth the price of admission, that’s really never been a topic of debate. However, the McDavid show took center stage in Buffalo on Wednesday, October 22 as the Erie Otters topped the Niagara IceDogs 8-4 at First Niagara Center. As the Sabres are in the midst of a full organizational rebuild, the team took the opportunity to play host to an Otters home game, giving Sabres fans a chance to see McDavid play on the Sabres’ home ice. The phenom didn’t disappoint, putting up a goal and three assists and dazzling the crowd throughout the night. To see McDavid play in person is nothing short of a visual treat. His speed, vision and hands are so far above that of anyone else at the junior level that the chance of a highlight each shift far surpasses the 20% chance that the NHL’s 30th place team will have of drafting him in June. Wednesday marked my fourth time seeing McDavid play in person. The other three occurrences came in Erie and he has put up 13 points in those four games. To say he’s on another level doesn’t even begin to explain his on-ice exploits at times. For example, on a penalty kill Wednesday night, McDavid took a loose puck in the Erie end and proceeded to create a partial breakaway all by himself. He didn’t score on the break, but the move he used to create the scoring chance was the most mesmerizing thing I’ve ever seen done on an ice rink. The First Niagara Center crowd reacted as expected with a roaring “Oh!” after the deke to free up the scoring opportunity. Given the thin seasons the Sabres have suffered through lately, the reaction elicited by McDavid was almost as impressive as the play on the ice. He was the center of attention the entire game and he performed like someone well aware that all 11,000 fans were there to see him play. There are well over 70 games left to be played by each NHL franchise and those sitting in the basement – including the Sabres – are likely dreaming of McDavid donning number 97 for them a year from now. Sabres fans have been to McDavid, Jack Eichel and even Noah Hanifin this fall and the team’s minor league club will take to the First Niagara Center ice at the end of October to give the fans a full preview of what the future may hold. The divide between fans talking about tanking the season or rooting for the first pick is broad. As someone who knows the likely end game for this particular Sabres roster, I have never rooted for my team to lose. It’s an awful feeling to root against your favorite team and I could never turn off the TV or leave the arena happy with a loss. However, knowing that this roster is built more for a last place finish rather than a playoff spot makes the losses easier to handle. It’s one thing to accept a loss and quite another to root for a loss. I certainly count myself as part of the former but McDavid’s on-ice exploits even had me feeling goosebumps and hoping the Sabres leave the draft lottery with the first pick. He’s that good and that inspiring. If you have the chance to go see him play live, do it. Don’t wait, don’t hesitate and don’t miss the chance to truly see him dominate. He’s going to be a star in the NHL but to see someone with world-class skill absolutely dominate a game like he does at the OHL level is a rare treat that every hockey fan should get to experience. Keep your eyes peeled this season. You’re going to start seeing more and more CCM products around the rink and on television. While they never technically left, CCM’s return to the rink just over five years ago was a notable milestone for the manufacturer. Part of the Reebok family (which also took over Koho, Jofa and Titan in the early 2000s), CCM has a strong presence in today’s equipment landscape. Sticks like the RBZ SuperFast and the return of the Tacks skate have elevated CCM to new heights in equipment design and innovation. Of course, their line offered, in some ways, a direct competition to the equipment being built and sold by Reebok. Instead of having the two companies fight for attention and players, they altered the landscape they operate on. CCM will maintain their status as a brand leader for elite equipment while Reebok will be entry level to mid-price point in senior, junior and youth equipment. That means that players who previously used Reebok equipment in the NHL will be wearing more CCM just as products like the Ribcor stick will now be sold with CCM branding as opposed to Reebok. The quality certainly won’t change, just the window dressing. It’s still a cool development, particularly with the strength Bauer has shown in recent years and the obvious push coming from CCM. The RBZ stick line is beyond revolutionary and both the RBZ and Tacks skates are excellent products which offer a true challenge to Bauer. There is one other front that could see CCM grow even more and that’s in the crease. The Reebok goal line is still being worn by quite a few netminders and exactly what will come of the Reebok goal collection doesn’t seem as clear as the player line. However, the CCM Extreme Flex goal pads are a monster hit and continue to find their way into more and more locker rooms in the NHL and beyond. The CCM goal mask line was far superior to that of the models released by Reebok a few years prior and the same can be said for many other aspects of CCM’s goal equipment line. Perhaps the only sector Reebok truly had an edge in was skate design. The Reebok skates – both goalie and player – have been quite popular since their inception and while the RBZ and Tacks are phenomenal skates, models like the Ribcor are still elite in their own right. While many of CCM’s products may be seen as superior to begin with, the company ought to see a boost thanks to the quality in skate design that Reebok has established. At the end of the day this transition doesn’t change much in terms of the big picture. In fact, based on equipment that I’ve personally used, much of CCM’s elite level gear is superior to begin with. So while there will be more exposure and equipment choices for CCM, the product quality certainly isn’t going to change. Simply put, this is a wise decision to allow a growing industry leader get that much bigger. As the changeover continues, players will see more and more Reebok products change over to CCM. In the meantime, have fun scavenger hunting for the CCM logo in places you’re not used to seeing it. Buffalo played host to an impressive array of draft eligible prospects last week including a pair of players expected to be picked in the top-five. Jack Eichel and Noah Hanifin headlined the 2014 CCM All-American Top Prospects game as the city of Buffalo and First Niagara Center played host to the event for the second time. The game will remain in Buffalo again next season as well. A light crowd took in the game as many seats were left empty despite the Sabres distributing tickets to season ticket holders this year. Despite the presence of the draft’s second most sought after player (and the third depending who you ask) marketing for the event was light and the crowd reflected that. However, the hockey didn’t disappoint. Eichel was dynamic throughout the game and created opportunities from puck drop. He finished the night as the game’s MVP after finishing with a goal and an assist. It was the goaltenders who stole the show to start. Luke Opilka and Mike Lackey were phenomenal through the first 20 minutes as they consistently turned away high-quality chances. As the pair made the first period a goaltending duel, Teams Olczyk and Grier made the final 40 minutes a shootout. Alec Baer finally broke the scoreless tie just five minutes into the second period and Brendan Warren answered for Team Olczyk just over a minute later. Baer and Warren’s tallies would be the only goals surrendered by Opilka and Lackey as they gave way to Ryan Bednard and Ryan Larkin midway through the second. The cold goaltenders didn’t have much time to settle in as Eichel combined with Jeremy Bracco for a pretty goal midway through the period. Karch Bachman would add another tally for Team Grier while Tom Novak scored for Team Olczyk to bring the score to 3-2 after the second. Eichel would eventually register the game winning goal as three third period tallies from Team Grier iced the victory. Eichel and Bracco each had two points and Eichel’s game winner and dynamic play helped preserve MVP honors. Next for this group of players will be an important year with their respective clubs. Many will be positioning themselves for spots on the US World Junior Championship roster as they work through their season in junior or NCAA. For Buffalo, their relationship with USA Hockey continues to blossom. HARBORCETNER is set to host the NHL Combine and will most certainly hold most, if not all of next year’s All-American Prospects Game participants. The next US bid for the World Junior Championships will likely see Buffalo as the host yet again as the city’s proximity to Canada and love of hockey helped draw record crowds in 2011. Another key will be ensuring next year’s event sees a better turnout. Unfortunately the Sabres didn’t do too much public outreach for the event as it is truly a USA Hockey property. However, the Sabres had an opportunity to shout from the rooftops that two of the draft’s top three prospects were going to be playing against each other at First Niagara Center. The team’s president often preaches about the hockey IQ in Buffalo and this is the type of game that not only allows the region to show off that supposed IQ, but to grow it as well. This is also an issue that lies with the game itself. It’s a very new event without the name recognition or prestige of the CHL Top Prospects game. While this year’s game boasted a pair of lottery picks, that isn’t the case each and every year. USA Hockey and their respective hosts need to continue to promote the fact that there are elite players playing each year to ensure that American hockey fans take notice of this very cool event. Perhaps we are still a few years off from seeing arenas with more fans than empty seats, but the process is certainly in motion. One thing is for sure, the on-ice product in each event has been spectacular and that doesn’t seem likely to change any time soon.